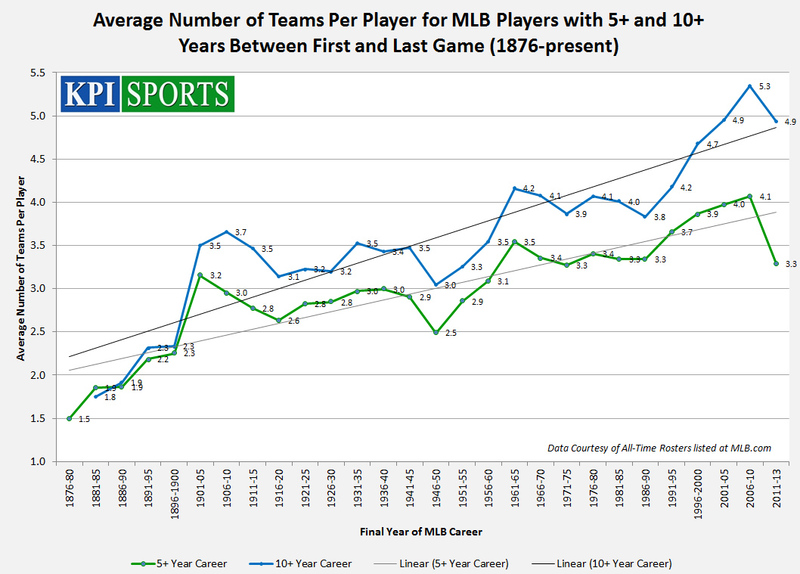 @KeithOlbermann @LenKasper I think I have a way to chart the avg # of teams each MLB player played for by career length. Will circle back. It seemed harmless enough, except for the fact that it got me curious. A KPI Sports study of more than 17,000 Major League Baseball players who at one point played for one of the current 30 Major League Baseball franchises showed that players (as many assumed) are in fact playing for more teams now than ever before. For players with a career length of 10 or more years, there was an increase of 1.51 teams per player for careers ending between 1986-90 and 2006-10. Creation of the American League: As the American League began to establish itself as a major league in 1901, the number of teams players could play for increased (as did the number of active players in MLB). That number stabilized at 16 teams and remained that way from 1901-60. 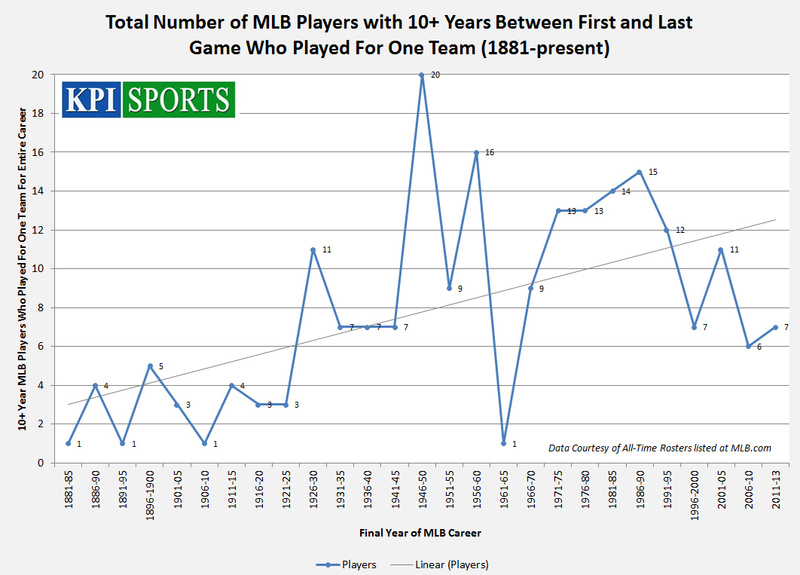 Players with a career of 10+ years played for between 3.0 and 3.7 teams during every five-year interval from 1901-60. World War II: There was, however, a slight dip in the number of teams per player just after the end of World War II. Many careers were interrupted by the war as players honorably served their country. Players with 10+ year careers ending from 1946-50 played for 3.0 teams per players (2.5 teams per players for players with 5+ year careers over the same period), the fewest teams per player since 50 years earlier. Expansion: From 1961-69, MLB expanded from 16 to 24 teams. Both the expansion drafts (there were eight teams to fill) and the additional opportunities on new rosters for players cut contributed to an increase in the number of teams with which a player could sign. 228 players moved to new teams as a direct result of the expansion drafts for the new teams entering MLB in the 1960s. Free Agency: Free agency essentially began in 1976. It ended baseball’s reserve clause and opened the door to far fewer restrictions on player movement between teams. Players who played 10+ seasons averaged 3.8 teams in 1986-90, a number that steadily grew to 5.3 teams per player by 2006-10. Note: Because data is tracked based on retirement date, the resulting increase from free agency was not immediate. The Future: There is a slight dip (and trend reversal) in teams per player for 5+ and 10+ year career players since 2011. Until the five-year interval is complete after 2015 (with data coming after 2016), it is premature to know whether this is an actual trend developing or simply incomplete data. Players still have more time during the current five-year period to see if they will change teams. Players like former Phillies shortstop Jimmy Rollins have already changed teams this offseason. KPI Sports also reviewed data from 215 Hall of Fame players who were enshrined in the Hall of Fame as players and played for a current MLB franchise. That group averaged 2.81 teams per player dating back to careers ending as long ago as 1891. The average career length from this group was 18.1 years. 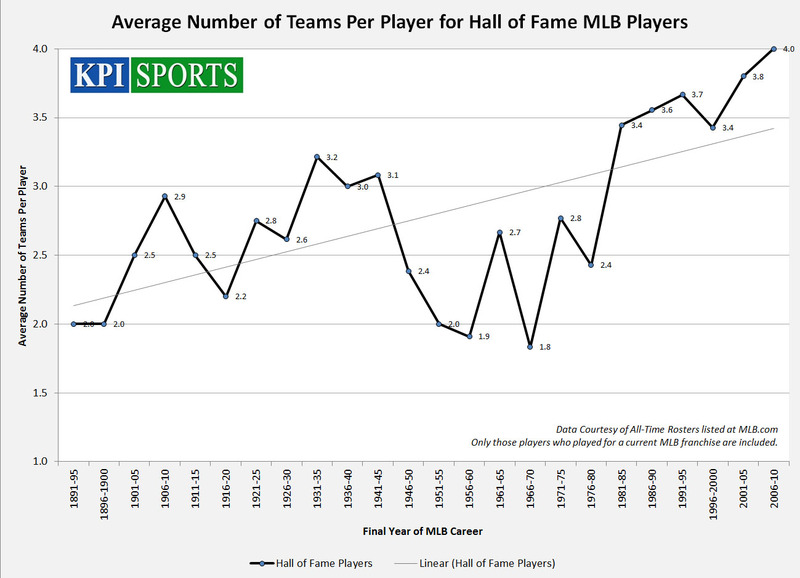 There has been an increase over the last 20+ years in the number of teams for which each Hall of Fame member has played as well. Since most Hall of Fame players were not affected by the expansion drafts of the 1960s, the trend during that time period is different from the larger group of all MLB players. The sample size in each five-year interval is often times small, ranging from four to 16 players in a given interval. There are very few players who play an extended career in MLB with one team. 227 players with 10+ year careers (5.7% of all 10+ year players) stayed with one team for their entire career. With data again tracked over five-year intervals, there has been a decrease in the percentage of players who play with only one team since the start of free agency. There is an inverse relationship between the number of 10+ year career players playing for only one team and the increase in number of teams for which the average player plays. The total number of players playing for one team (rather than a percentage of players) can be a bit misleading because of the increase in the number of teams (from 16 in 1960 to 30 by 1998). Still, the data shows that while by no means is the one-team player dead, it is becoming slightly rarer. Number of Teams: 46.1% of MLB players will only play for one team during their career (many of those players will only play for one or two seasons). 67.5% of players will play for two or fewer teams, while 81.4% will play for three or fewer teams. 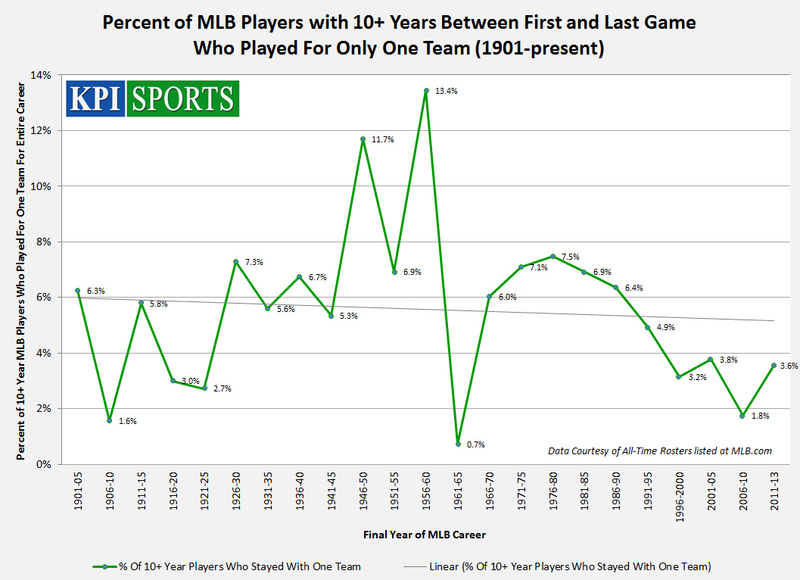 The average player will play for 2.25 teams over the span of their major league career. Three players (Matt Stairs, Mike Morgan, and Ron Villone) all played for 12 teams during their careers. MLB.com does not list Octavio Dotel as playing the 1999 season with the New York Mets, which would in fact make Dotel a 13-team major leaguer. Stints with Teams: 2,243 players (12.4% of those tracked) have had two or more non-consecutive stints with a team. A total of 99 players (0.6%) made three stints with the same team while four players (0.02%) had four stints with the same team. Those four players were Bobo Newson (Washington Senators), Kent Mercker (Cincinnati), Terry Mulholland (San Francisco), and Tony Fernandez (Toronto). Both Mercker and Mulholland’s fourth stint technically came with a year of no games played over an extended single stint, so some may consider it three stints depending on the parameters chosen for such data. Career Length: The average career length of a MLB player is 6.06 years per player, while the median is five years. 23.1% of players play for only one season while 55.2% of players will play five seasons or less. There are a total of 4,009 players who had at least 10 years between their first and last games (23.3% of all players). Incredibly, there are 235 players (1.4%) who had a career spanning 20 or more seasons. The University of Colorado commissioned a study in 2007 to look at the length of a Major League player’s career. Tracking data from 1902-93, the average career lasted 5.6 years based on their findings. The data was initially obtained from the “All-Time Roster” pages for each Major League Baseball team at mlb.com. Hence, only players who played for one of the current 30 MLB teams at some point in their career are included (that means a few players who played only for now defunct National League teams prior to contraction in 1900 are not counted). Also, any errors from those rosters (I found very few) are carried over into this project. I believe most, but likely not all, of these errors were caught. Some data (like MLB.com listing Everth Cabrera’s career as 2005, 2008-14 and Octavio Dotel’s career number of teams) has remained as is in order to maintain consistency in how MLB.com generated their data. There are several players who have the same name as other MLB players. Excel doesn’t like when two values mean two different things! In order to identify and separate these players, I ran three different passes through the data (by position, by year played, and by team). I believe I have correctly separated most if not all like-named players, but there’s always a chance that I missed someone along the way. Many names were known (there were two players named Alex Gonzalez playing from 1991-2014, both playing shortstop, for example), but many weren’t (there were four Bob Smith’s!!). It is also important to note that the length of a player’s career is measured as the time between that player’s first and last games. For example, Adam Greenberg played briefly in 2005-06, then again for the Marlins in 2012. The length of his career is tracked as eight years. The data was moved into Microsoft Excel and converted into sortable cells. I sorted the data and wrote several formulas to identify start and end dates of both stints with individual teams as well as track each player’s career. The spreadsheet totals 657,560 cells of numbers (38,680 rows x 17 columns) and tells a fascinating story of a typical Major League Baseball career by era. The data is not perfect. Discrepancies in data do exist as outlined above. The margin of error is estimated at approximately 1.29%. Posted in KPI Sports Study and tagged KPI Sports Study, MLB.